Here in Nova Scotia, the New Year's Day tradition is the levee. Food, drink, socializing, and music are the order of the day. I come from the South (as in Kentucky, in the US) and there we have a long-standing food tradition that my superstitious soul cannot withstand. On New Year's Day, one must eat black-eyed peas and cabbage. My mother says the black eyed-peas are for luck and the cabbage is for money. If you think I'm making it up, click on this link to get a bit more on the background of this tradition- though the Texans are claiming bragging rights. So, on the first day of the year, for as long as I can remember, I've eaten black-eyed peas and cabbage. Recently (and mainly due to my husband getting tired of just boiled cabbage and plain old black-eyed peas), I've tried some new recipes. 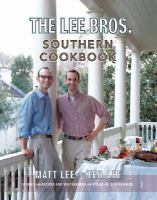 This, year, I found The Lee Bros. Southern Cookbook, by Matt and Ted Lee. Not only does this book have several interesting recipes for Hoppin' John (a black-eyed pea dish that typically includes tomatoes and hog jowl), there are several fancy ways of dressing up cabbage. 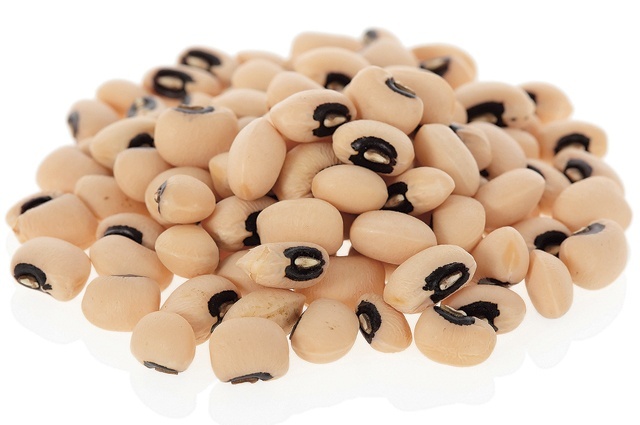 Now, finding black-eyed peas in Nova Scotia can be tricky, but there are stores that carry them in cans (which makes for a quick batch of Hoppin' John), and I have found them dried at times. Cabbage is in abundance, but I think you need the green kind for it to count, so make sure you include that in your recipe. Good luck to all, and a prosperous 2013. Now go eat your black-eyed peas! Lego at the Library? Who'd have thought! Yet Lego is quickly becoming one of the most popular programs the library offers for children. Connie Jodrey says, "Thanks to a grant from the Town of Bridgetown via the Community Spirit Award, the Bridgetown and Area Library is offering an after-school Lego program on Thursdays from 3:30 to 4:30. And this is not just for older kids. 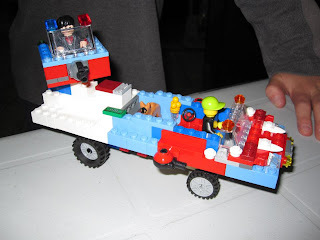 We have children as young as three squeezing in around our table heaped with Lego and Duplo blocks, happily snapping out cars and towers, castles and cranes, sharing pieces back and forth when someone else wants them. You don't need a plan when you put a pile of Lego in front of a child, you just need to stand back and watch the magic happen." Why LEGO you may ask? There are plenty of studies that show the value of free play and learning, and how it enhances creativity. Play is how children experiment, learn social interactions, and experience curiosity, while exploring feelings of pride, love, and feeling smart. Pretty powerful stuff is going on there with those piles of plastic blocks! Since the library is a place of lifelong learning, we are happy to be your child's destination for a weekly hour of play. If you want to read more about play, check out this study done by the LEGO learning institute. At the library programs, we ask that children DO NOT bring their own LEGO. We have a big stash of blocks for you to build with. And if you have LEGO lying about that is no longer being used, we WILL take donations! Here's where you can attend a LEGO program in January. Stop in and build something! The last day of our cookie adventure has arrived. We hope you have enjoyed it as much as we have. These cookies were baked by Angela Reynolds, our Head of Youth Services. If you make your way out to the Summerville Library Satellite Site, you might get to try one! Preheat the oven to 350 F. Grease 2 baking sheets with butter. Beat together butter and sugar with an electric handheld mixer until light and fluffy. Add the egg and milk and beat for another few minutes. Sift the flour into the bowl and add the salt, anise, and baking powder. Using a metal spoon, fold in the dry ingredients. Fold in the Pernod, if using. Tip the dough onto a lightly floured surface and divide in half. Roll each piece into a sausage shape and cut into slices (less than an inch). Put the cookies onto the prepared baking sheets, spaced well apart. Brush each with a little milk and bake for 12-20 minutes*. Remove from the oven and cool on a wire rack. *Original recipe says 20 minutes, mine were done in 12. Angela’s notes: Since these were very similar to another cookie I make, I dusted one batch with a sugar/cinnamon mixture before baking (and it tastes very nice!) This recipe is pretty easy; I think it would work well with kids. They would certainly enjoy rolling the dough into a sausage shape and cutting the slices. 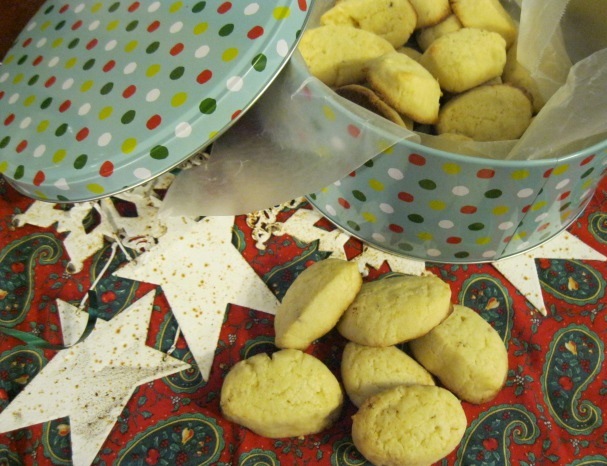 Andrea Leeson, the branch manager at the Kingston Library, has baked 2 batches of cookies. 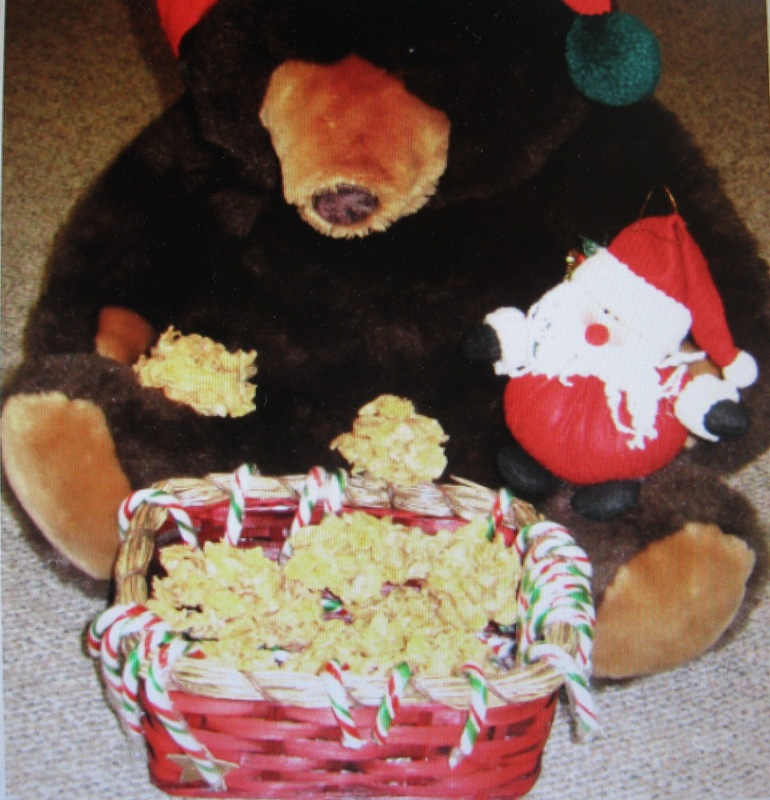 Stop by the Kentville Library and see if there are any left! Below is the recipe for Butterscotch Cookies, plus some notes from Andrea. The easiest cookies of all: Butterscotch Cookies (above). It’s in the Company's Coming series: Most Loved Treats —a great book of everything easy and delicious. 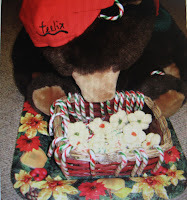 Felix the bear liked these best. 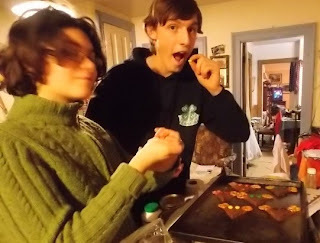 He tried the Joy of Cooking, Christmas Cookies , which you see in the righthand picture: Piped and Pressed Spritz Cookies which are delicious Scandinavian cookies, but they were really labour intensive and 24 looked like nothing, so we had to supplement with the Butterscotch cookies. Remember the ad where the mum flicks some flour on her face, pretending to have worked so hard, and heads into dining room with a plate full of Rice Crispy Squares and everyone cheers? These are the same deal—a bit of shopping, 15 minutes of kitchen time and rave reviews. Heat peanut butter and chips in a large heavy saucepan on lowest heat, stirring often, until chips are almost melted. Do not overheat. Remove from heat. Stir until smooth. Add cereal and pecans. Stir until coated. Drop, using 2 Tbsp. (30 mL) for each, onto waxed paper-lined cookie sheets. Let stand until set. Makes about 2 ½ dozen (30) cookies. These adorable cookies were made by an adorable baker. 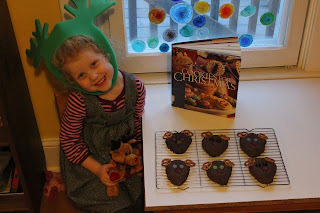 Chocolate Reindeer from the book Cookies for Christmas by Jill Darling. Don't forget, you too can enter to win a gift card. Entries must be in by midnight Tuesday, December 18! Details HERE. If you are near the Windsor Library this afternoon, stop in and try these Chocolate-Tipped Butter Cookies which were baked by Charlotte Janes, our Head of Systems & Administration here at library headquarters. And don't forget, you still have a few days left to get in on the fun! Here are the details. In a large bowl cream 1 cup butter and confectioners' sugar until light and fluffy. Add flour and vanilla; mis well. Cover and refrigerate for 1 hour. Shape 1/4 cupfuls of dough into 1/2 inch thick logs. Cut logs into 2 1/2 inch pieces; place 1 inch apart on ungreased baking sheets. Bake at 350 degrees for 12-14 minutes or until lightly browned. Remove to wire racks to cool. In a heavy saucepan or microwave, melt chocolate and remaining butter; stir until smooth. Dip one end of each cookie into chocolate, then dip into nuts. Place on waxed paper at room temperature until set. Yield about 5 dozen. 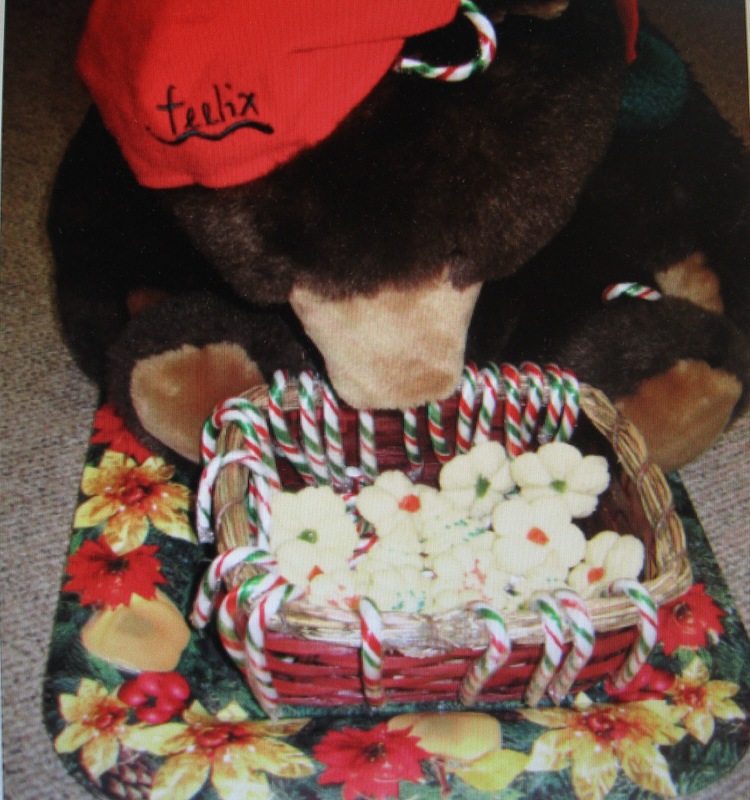 "a little twist on a shortbread cookie"
Sandie Troop, who works at the Annapolis Royal Library, made these cookies. 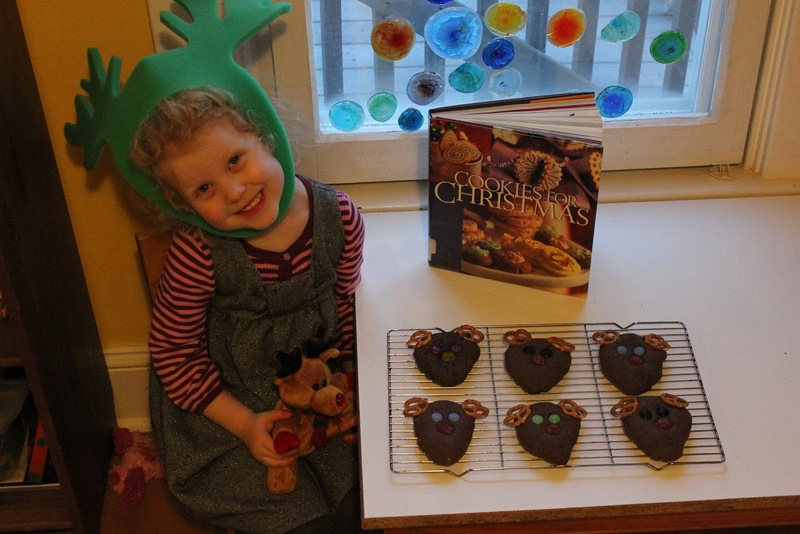 Her super-cute batch of reindeer will be at the Lawrencetown Library today! In a large mixing bowl beat butter with an electric mixer on medium for 30 seconds. Add cocoa, sugar, cream of tartar, baking soda and salt. Beat until combined. Beat in eggs and vanilla until combined. Beat in as much of the flour as you can with a mixer and then finish adding in the flour with a wooden spoon. Divide dough into 6 equal portions. Wrap portions in wax paper and chill for 3 hours. On a lightly floured surface roll each portion into a 6”circle. Using a knife, cut each circle into 6 wedges. Place wedges 2” apart on an ungreased cookie sheet. For antlers on each triangle lightly press a pretzel into each of the upper corners. Press in chocolate pieces for eyes. For the nose press a red gumdrop into the dough about ½” from the point. Bake in a 375 degree oven for 7-9 minutes or until edges are firm. Do not over bake. Cool on cookie sheet one minute. Transfer to a wire rack to finish cooling. Makes 36 cookies. 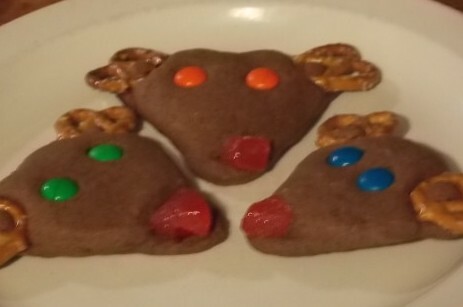 I made these cookies a couple of times when my kids were in preschool. They loved them and still remember them over 10 years later. When I spoke of making them again they wanted to help. The recipe is fairly easy and I mixed the dough while they were at school. We brought it out in the evening as it needs chilling time. They had great fun helping me and not all the cookies we made have made it to Lawrencetown. The chocolate taste is pretty good. I did have trouble locating small red gumdrops this year but eventually we just cut up red Ganong Christmas tree gumdrops and they worked fine.